Beneath an Old Bridge lies the next Drop, requesting judgment on a known psychotic. Shaleez is hiding in the Flooded Mine. Retrieve the next contract from beneath the Old Bridge. Go to the Flooded Mine, and find your way to Shaleez. Deal with her, then make your way to the next drop near the entrance to Fort Redman. Shaleez, a psychopathic killer and your new target, is hiding in the Flooded Mine just north of Bravil. The cave, as you may have guessed, is almost completely flooded. However, there are plenty of air gaps and you will not necessarily need any sort of Water Breathing ability. Shaleez might be swimming around the cave; if she sees you, she will attack on sight. The problem is that she will attack with an enchanted sword, which may be powerful enough to kill you very quickly. The exact sword is randomly determined; she will be carrying one non-enchanted shortsword, one enchanted shortsword, and one enchanted longsword (unless you do the quest at levels 1 or 2, in which case she will only have the non-enchanted shortsword). This problem is made worse by the fact that underwater fighting is very difficult compared to normal fighting. For an easier fight, lure Shaleez out of the mine where you have room to fight without being under water. Shadowmere will also help if you manage to get Shaleez out of the mine. 10 I have picked up my next contract from the dead drop beneath the Old Bridge. I have been ordered to kill an Argonian hunter named Shaleez, who is holed up in the Flooded Mine. She is a wanted psychopath, so I should be cautious. 20 Shaleez is dead. 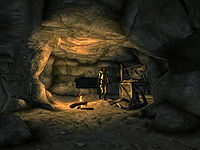 I must pick up my reward and next contract at the dead drop located in the coffin just outside the ruins of Fort Redman. It is possible to use the console to advance through the quest by entering setstage Dark13Justice stage, where stage is the number of the stage you wish to complete. It is not possible to un-complete (i.e. go back) quest stages. See SetStage for more information. Esta página foi modificada pela última vez à(s) 04h36min de 29 de agosto de 2013.